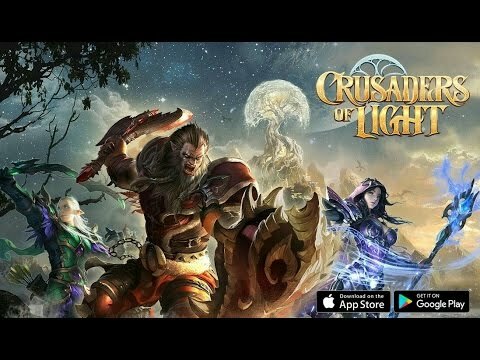 Crusaders of Light mobile game is a fantasy Massively-Multiplayer-Online- Role-Playing-Game that is played in a persistent colorful world. This game was developed and published by NetEase which is a Chinese game studio. In this game, the player has to make a choice between 3 classes. They can also take down bosses by joining 40-player raids. In the world that is full of adventure, the player may also get into arena battles and engage in the collection of new gear for the adventure. The video game has a medium player base and was released on April 20th, 2017. Crusaders of Light had more than 300 hours of gameplay available when it was first launched. After 700 years of peace, the Desolation Wall has fallen. It becomes the work of the player and his/her allies to battle against the hordes of demons that are currently occupying you piece of land. The gameplay of Crusaders of Light is pretty straightforward. Since it is MMORPG, the player has a number of options. The first option is to choose the class you want to play in as a Warrior, Mystic or Ranger. After this, you need to embark on a mission to make yourself more powerful. When you reach level 45, you get to unlock the system of advanced progression of the character. With this, the true potential of your character is harnessed. The gameplay also features a 3D world where the player explores. In this world are dangerous beaches, pirate ships, precarious dungeons, and verdant forests, all of which you’ll be exploring as the player. By joining a band and a guild, you’ll fight the lands most formidable bosses together in a raid composed of 40 players. In the process, you’ll uncover treasures that had been lost. As a hero, you can make use of the looted gear to equip yourself. The gear will help you substantially increase your powers and enhance your statistics. The game also allows you to engage in the arena with other players. The arenas feature 1vs1, 3vs3, or 5vs5 tactical fights. If you work together as a team in these arenas, you’ll win as a unit. Also to get a chance to hone your battles skills, you can take part in 25vs25 battlegrounds. The combat aspect of the game is quite basic. There are a basic attack and six active slot skills. Two slots are for special skills and the other four are changeable. These are available alongside other skills unlocked by the character. Crusaders of Light uses touch targeting. If unable to select the monster to kill, you can make use of the “Next Target” button. There are three classes in this game that a player can choose to play as. These classes are the Ranger, Warrior, and the Mystic class. You can join a band of 40 players and work together to deal with treacherous bosses and romp through the dungeons. To get to hone your skills in large scale battles, you can join the 25vs25 chaos. The player can unlock the system of advanced character progression when they reach the 45th level. To test your abilities, you can join the arena with your friends and take part in 1vs1, 3vs3, or 5vs5 matches. Bottom line, Crusaders of Light mobile is a nice MMORPG. The fact that it allows you to play along with friends makes it interactive and therefore great to play.